Antibiotics, steroid hormones (e.g. the contraceptive pill), sugar and allergens such as wheat, cause the gut lining to become inflamed and 'leaky', or too permeable, and food and chemical portions enter inappropriately. Read more below the product list. 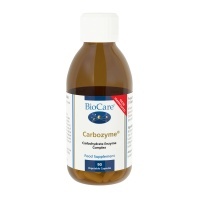 BioCare Carbozyme provides amylase that digests starch & carbohydrates in foods like potatoes, rice & cereals. 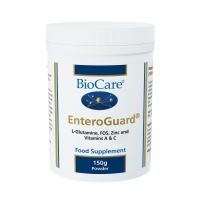 Provides intestinal nutrients to nourish the epithelial tissue lining the intestinal tract & help support intestinal membrane integrity. 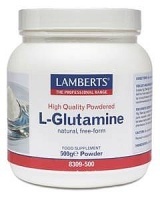 Nutri L-Glutamine - Amino acid that supports brain, skeletal muscle and blood. When there aren't enough nutrients available for all the functions of the body, some areas will suffer. 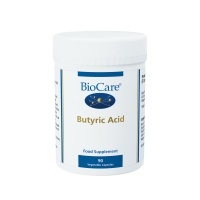 One scenario might be (and often is) that a lack of vitamin B6 and zinc will not enable the body to make enough stomach acid (hydrochloric acid) which, in conjunction with a digestive enzyme, is needed to break down protein. 'Leaky gut syndrome' is a proposed condition some health practitioners claim is the cause of a wide range of long-term conditions, including chronic fatigue syndrome and multiple sclerosis (MS). 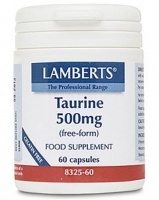 This barrier is effective at absorbing nutrients, but prevents most large molecules and germs passing from inside the bowel into the bloodstream and potentially irritating the bowel lining. Alcohol, aspirin and non-steroidal anti-inflammatory drugs (NSAIDs) such as ibuprofen are well-known irritants of the bowel lining. They damage the seals between cells, allowing water-soluble substances to pass through the gaps and into the bloodstream. 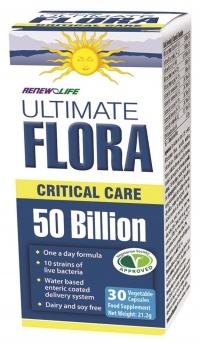 Gastroenterologists (specialists in diseases of the gut) generally agree that these irritants do not usually cause anything more than just mild inflammation of a particular area of the bowel, and the bowel lining becomes even more porous as a result. At the very worst, the inflammation might be bad enough to cause ulcers in the bowel lining. 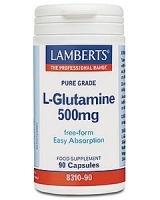 The vast majority of people who consume lots of alcohol or regularly take aspirin or ibuprofen have none of the widespread symptoms or health conditions that proponents of "leaky gut syndrome" mention – health problems you would expect if the theory was true. Generally, only in these situations might treatment for a "leaky" bowel be necessary. For example, people with Crohn's disease usually benefit from medication to reduce the bowel inflammation, and may also benefit from a liquid diet (read more about the treatment of Crohn's disease).